In the state of Georgia, a mechanic's lien is a tool for contractors, subcontractors and others in the home improvement and repair trades to force payment of a bill for work performed. 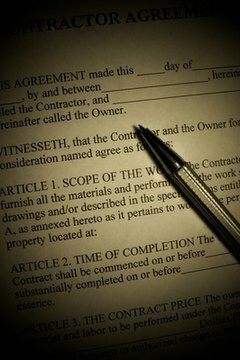 Several conditions are set out in Georgia law that, if not followed properly, will result in the court invalidating the lien. If you are a contractor, it is important to know these conditions so you can avoid non-payment of your work. Complete a lien form. Make sure to include a statement that the lien expires 365 days from the filing date, rather than the date the work was completed, unless further action occurs, such as civil suit or bankruptcy. Lien templates are available at many websites for a fee. Look for a template or form formatted specifically for Georgia. Gather and make copies of all contract documents signed by the customer. The contract documents and the lien form must be filed within 90 days of the date work was completed or substantially completed. This is not necessarily the date the customer failed to pay for the work. Use the wording supplied by the state. The Official Code of Georgia, Annotated, gives specific language for the body of the lien form: "A.B., a mechanic, contractor, subcontractor, materialman, machinist, manufacturer, registered architect, registered forester, registered land surveyor, registered professional engineer, or other person (as the case may be) claims a lien in the amount of (specify the amount claimed) on the house, factory, mill, machinery, or railroad (as the case may be) and the premises or real estate on which it is erected or built, of C.D. (describing the houses, premises, real estate, or railroad), for satisfaction of a claim which became due on (specify the date the claim was due) for building, repairing, improving, or furnishing material (or whatever the claim may be)." File the form at the office of the Clerk of Superior Court in the county in which the property is located, even if the owner of the property lives in another county. The lien attaches to the property, not the owner. As of 2009, the filing fee set by the state was $4.50 for the first page and $2 per page after that. Within two days of filing the lien at the courthouse, send a copy of the claim by registered or certified mail to the owner of the property.Send a notice to a registered agent if the owner is a corporation, or advertise.in the newspaper. Take action on the lien within 365 days to keep the lien from becoming invalid. Arbitration, settlement, civil suit and bankruptcy actions will serve to keep the lien in force, but the court must be notified in writing if any of these events occur. The Chapman Firm Seminar: "Mechanics' Liens and Surety Bonds Under Georgia Law"
Governor's Office of Consumer Affairs: "Liens Against Your Home"
Official Code of Georgia Annotated: O.C.G.A. § 44-14-360 et seq. Lynn, Audrey. "How to File a Georgia Mechanic's Lien." , https://legalbeagle.com/6646213-file-georgia-mechanics-lien.html. Accessed 19 April 2019.